Our building was built in 1970 for our congregation. 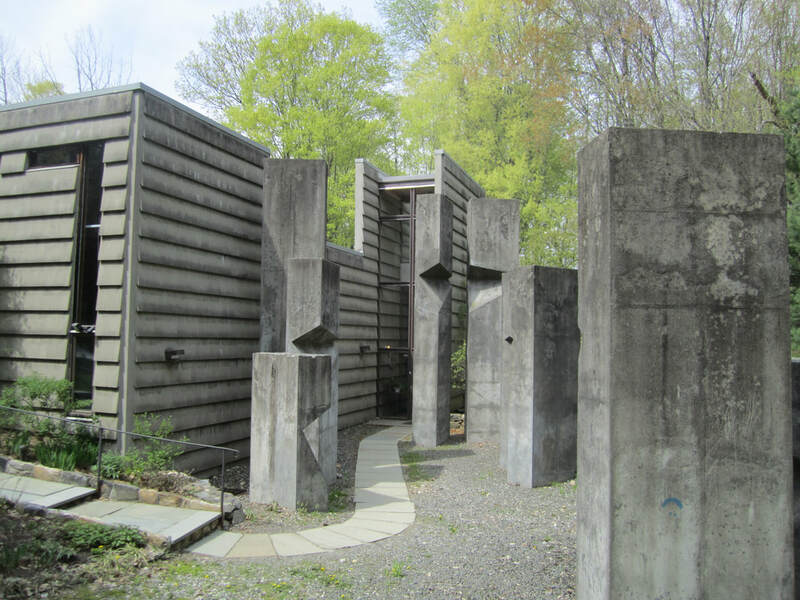 Designed by modernist architect Victor Christ-Janer, it is usually considered an example of the architectural style known as “brutalism,” which features exposed concrete, an attention to flow through the building, and sculptural detail. 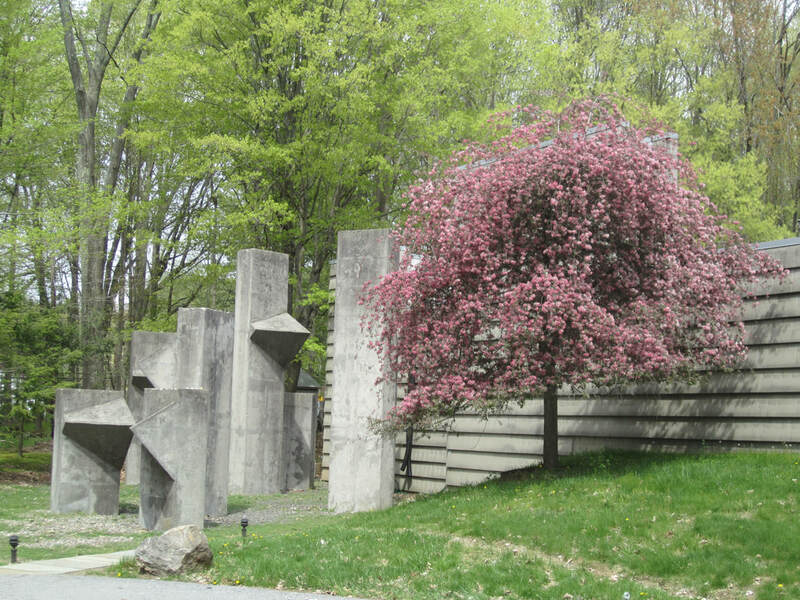 For our building, Christ-Janer designed clusters of large concrete towers at each entrance. In his plan, one entered the building via a hallway that leads directly into the worship space, past the towers with pointed protrusions symbolizing male energy. After worship, one would leave the building via the wide, glass doorway near the towers with corresponding indentations, which symbolize female energy. Soon after construction, the congregation began using the more welcoming, wide doorway as a main entrance and exit for everyone. The building was mentioned in Christ-Janer’s 2008 New York Times obituary for his use of earthquake-resistant concrete shingles that he designed. These shingles would later be used on a number of Christ-Janer’s buildings. Our Fellowship’s building has been featured on several tours of notable modern architecture in the area. We appreciate the massive wood beams inside, and the beautiful ways in which high windows scatter light throughout the day. We strive to make our building and worship as accessible as possible. If you have particular access needs not already met, please feel free to contact us and we will do our very best to accommodate you. While our main entrance can be reached only by a walkway that features steps, wheelchairs, scooters and strollers can use the original front entrance to our building, which will be open on Sunday mornings. During the week, this is the main entrance used by the preschool that rents our building, so please ring the bell for admission. Our three bathrooms are all all-gender, single-toilet restrooms. Both bathrooms on our main hallway feature changing tables for babies. One of our restrooms is fully wheelchair accessible, with transfer bars around the toilet. The restroom located on our rear hallway nearest our children’s classrooms, is set up for the use of small children. For worship services and other programs with amplified sound, we have several assisted-listening headsets available at our sound booth, located at the rear of our worship space. Large-print copies of our hymnal are available on Sunday morning for the visually impaired. We are a welcoming congregation for neurodivergent people, including children and adults on the autism spectrum. We encourage you to let us know how best to help you and your children feel at home at our Fellowship.